Looking at this picture, it seems pretty obvious that something is seriously wrong with the floor… right? And yet, as we should all know by now, things aren’t always as they seem, no matter how hard our brains try to reconcile the fact that a flat surface can look so believably sunken on one side. 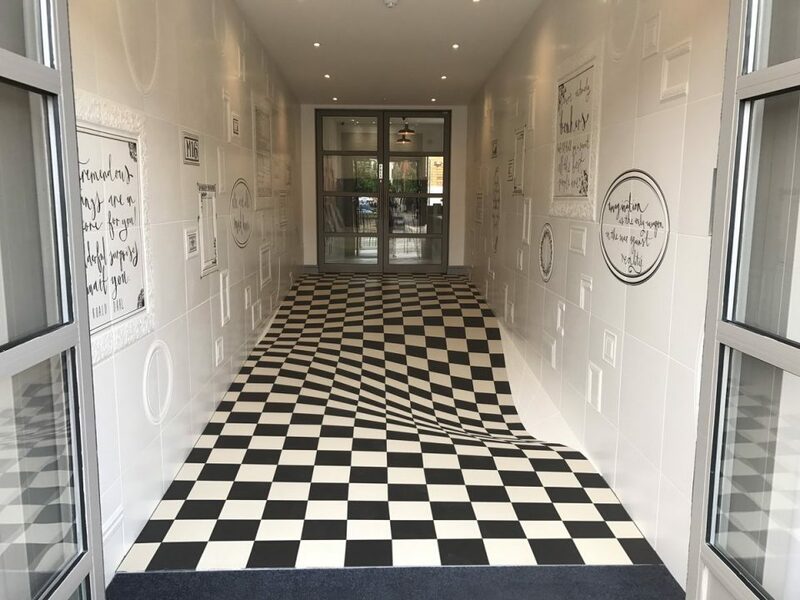 It’s kind of hard to wrap your mind around the fact that the effect is achieved simply by warping the shape of the tiles as they’re applied to the floor. Apparently, the illusion only works from one direction, and when visitors are exiting the building, it looks like a normal tile walkway. Unsurprisingly, the illusion blew up on Twitter and became something of an internet sensation. You might dig through the company’s website or Instagram hoping for more optical illusions, but it looks like most of their work is pretty standard. Maybe this project will get them some fun commissions.